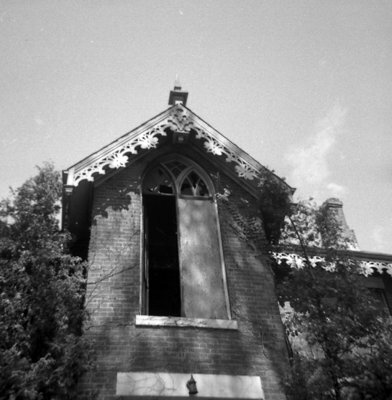 A black and white photograph of the upper window on the front of the house located at 720 Dundas Street East. The Joshua Richardson home was built at the north-east corner of Dundas and Garden Streets (at 720 Dundas Street East), and was demolished in 1969 after several fires were set in it. In the 1920s it was a tourist home called "The Evergreens," and was purchased by Alger Press of Oshawa in November 1936, for use as a printing plant. 720 Dundas Street East, September 1964, Brian Winter. Whitby Archives A2013_004_172.